Based upon a web search and other aerial map samples posted online, Belhaven College contacted Randal Birkey to create a custom map featuring their various campus locations in: Memphis, Tennessee, Orlando, Florida, Houston, Texas, and Jackson, Mississippi. 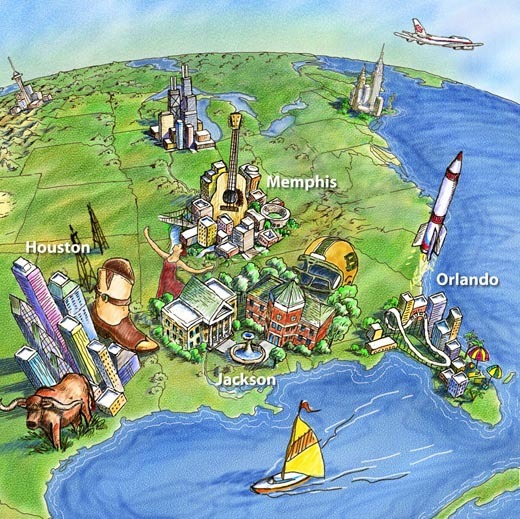 To help give the map a sense of orientation and scale, stylized skylines of Seattle, Washington, Chicago, Illinois and New York City were placed in the background. This illustration was done on a Mac using Painter and Adobe Photoshop software, and a Wacom Tablet. The final digital file was delivered via email to the customer.